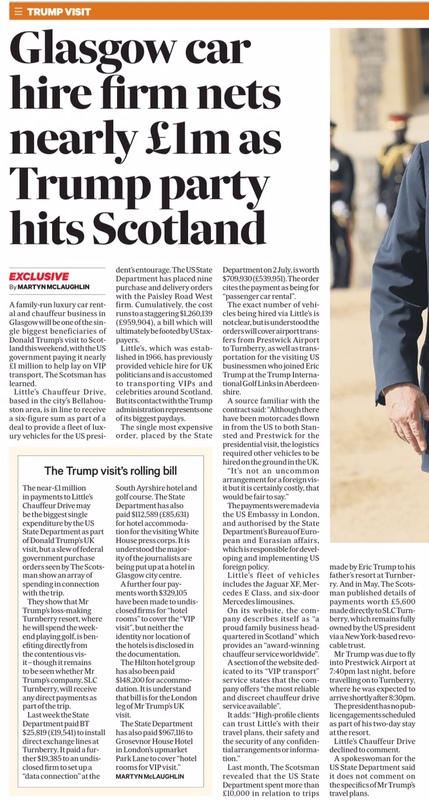 Near £1m for Trump’s Scottish visit – from The Scotsman – An exclusive showing the mounting bill to US taxpayers of Donald Trump’s 2018 visit. The costs include tens of thousands of pounds to upgrade communications at the US president’s Turnberry resort. A family-run luxury car rental and chauffeur business in Glasgow will one of the single biggest beneficiaries of Donald Trump’s visit to Scotland this weekend, with the US government paying it nearly £1m to help lay on VIP transport, The Scotsman has learned. Little’s Chauffeur Drive, based in the city’s Bellahouston area, is in line to receive a six-figure sum as part of a deal to provide a fleet of luxury and executive saloon vehicles for the US president’s entourage. The US State Department has placed no less than nine purchase and delivery orders with the Paisley Road West firm. Cumulatively, the cost for renting the firm’s cars to cover Mr Trump’s visit runs to a staggering $1,260,139 (£959,904), a bill which will ultimately be footed by US taxpayers. It is just one of the eyewatering expenses of the controversial trip, the details of which have been obtained by The Scotsman via US federal government orders. Little’s, which was established in 1966, has previously provided vehicle hire for UK politicians and is accustomed to transporting VIPs and celebrities around Scotland. But its contact with the Trump administration represents one of its biggest paydays. It and the other payments were made via the US Embassy in London, and authorised by the State Department’s Bureau of European and Eurasian affairs, which is responsible for developing and implementing US foreign policy. The exact number of vehicles being hired via Little’s is not clear, but is understood the orders will cover airport transfers from Prestwick Airport to Turnberry, as well as transportation for the visiting US businessmen who joined Eric Trump at Trump International Golf Links in Aberdeenshire. A source familiar with the contract said: “Although there have been motorcades flown in from the US to both Stansted and Prestwick for the presidential visit, the logistics required other vehicles to be hired on the ground in the UK. It adds: “High profile clients can trust Little’s with their travel plans, their safety and the security of any confidential arrangements or information. Other federal government purchase orders seen by The Scotsman show that Mr Trump’s loss-making Turnberry resort, where he will spend the weekend playing golf with business associates, is also benefiting directly from the highly-charged UK visit. Only last week the State Department paid BT nearly £20,000 for engineers to install direct exchange lines at Turnberry, allowing Mr Trump and his advisers to hold secure telephone conversations. It paid a further £15,000 to an undisclosed firm to set up what federal receipts describe as a “data connection” at the South Ayrshire hotel and golf course. Another hefty sum paid by the State Department covers hotel accommodation for the visiting White House press corps. The accommodation bill alone for US media is $112,589 (£85,631). It is understood the majority of the journalists are being up at a hotel in Glasgow city centre during their time in Scotland. A further four payments worth of $329,105 (£250,307) has been made to undisclosed companies for “hotel rooms” to cover the “VIP visit”, but neither the identity nor location of the hotel is disclosed in the documentation. The Hilton hotel group has also been paid $148,200 (£112,617) for accommodation. It is understand that bill is for the London leg of Mr Trump’s UK visit. Last month, The Scotsman revealed the State Department spent more than £10,000 in relation to trips by Eric Trump to his father’s resort at Turnberry. In May, meanwhile, The Scotsman published details of payments worth £5,600 made directly to SLC Turnberry, which remains fully owned by the US president via a New York-based revocable trust. Little’s Chauffeur Drive declined to comment when contacted by The Scotsman. A spokeswoman for the US State Department said it does not comment on the specifics of current or future travel plans of Mr Trump.